We woke up last week and found that we’d skipped fall and gone straight to winter. Winter coats and scarves came out and noses froze a bit on the way to class or around town. Then it snowed for almost two days straight. It didn’t stick to the ground, just made everything wet, but it was all sorts of strange to see snow against a backdrop of colorful fall leaves. It’s still very chilly outside now, but supposedly we’ll be back to normal October temperatures by the end of this week. Which is good, because we don’t seem to have any heat in our room. We’re kinda cold. Aside from the snow though most of the week was relatively uneventful. I had a cold for a few days, an ailment I (somewhat dramatically) nicknamed The Death and which it seems almost everyone has been afflicted with at some point or another on this trip. We went to a German conversation hour on Tuesday and chatted with Andreas about various things in an attempt to boost our German skills beyond those of a little kid. 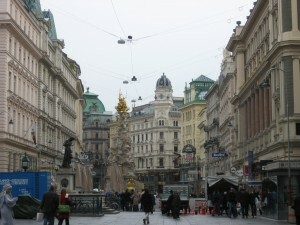 Wednesday we decided to be very Austrian and go out for coffee/hot chocolate after class in the morning which was fun. That night was our weekly girls’ dinner, but we agreed that rather than cook we would order pizza so we got our take-out fix in. We got up early yet again on Friday to leave for Vienna. We trekked across the country and got to the capital around noon. Our first order of business was a city tour. It was super cold and spitting rain, but the city is gorgeous and so full of things to see that it hardly mattered that the weather was out to get us. Later that afternoon some of us went to the Mozart House. 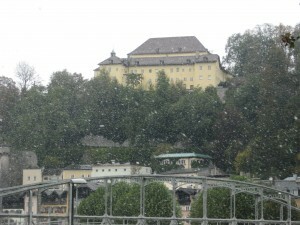 Yes, we have two of those in Salzburg, but, what can I say, the man moved around a lot. It was interesting to hear about his life and his family and all of the work he managed to get down in spite of the rotating cast of characters he entertained and hosted in his home. After the Mozart House we went out for dinner at an Italian restaurant near our hotel. Yay for spaghetti. Saturday morning we got to sleep in a bit before we went to the Kunsthistorische Museum aka the Art History Museum. Lots of very cool, very old paintings. Many of them seeming to feature dead fish. Not quite sure why. Some of us probably could have spent a lot longer in the museum (we hadn’t even made it to the ancient Egyptian section), but we decided to go check out the flea market down the street instead. We wandered for bit, Kirsten contemplated buying a violin, and I contemplated the potentially disastrous consequences of trying to get home any tea cups I might buy. Opted against buying one. Rachelle and I did, however, get lunch for less than two Euros when we bought a giant piece of bread and some hummus to share at the food section of the market. By the time we’d had our fair share of shopping some of my friends taking a philosophy class had to dash off for a tour of the Freud House, So it fell to me and Rachel to scope out potential dinner destinations. We settled on a place near the hotel recommended to us by a friend, and when everyone returned from the Freud House spouting philosophical theory we got dressed up and went out to celebrate Rachelle’s birthday at a restaurant that gave us more food than we could possibly have eaten. Especially since we were running short on time until we had to be at the opera. We ate as much as we could and made it to the opera house with enough time to get in line for last minute standing room tickets. 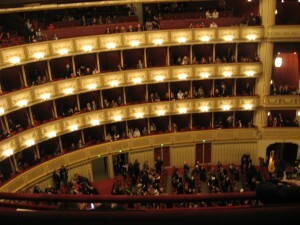 Regular seats at the Vienna Opera start at 50 Euros, but if you don’t mind sore feet you can get standing seats for 3, so we decided to go for it. We saw Tosca, which was part soap opera part comedy. It’s in Italian of course, but they have little screens with subtitles in English and German so we could keep track of the action. The singing was wonderful, the sets and costumes were gorgeous, and I still can’t quite believe we got to go to the Vienna Opera House. Luckily there were two intermissions that gave us a lot of time to sit and let our feet recover. We wanted to get famous Viennese Sacher Torte after the opera, but of course most of the cafes were closed at 10:30 at night. We settled for apple strudel. Still good. Sunday morning we got to Schönbrunn Palace before the mobs of tourists showed up. Schönbrunn is the former summer residence of the Hapsburgs. It was also the site of the famous meetings between Kennedy and Khrushchev in the ’60s. We took yet another audio tour through the palace and heard all about the millions of children Maria Theresa had and then married off to various heads of state. After the tour we climbed a little hill behind the palace and could look down on Vienna from up there. We got back on the bus as even greater mobs of tourists poured in and then sleepily made our way to Melk Abbey. Melk is in the middle of nowhere, and we had a sort of strange tour (Brightly color coded rooms? Strange statues built into the wall?) of the abbey. The best part of the whole thing though was the library. I want that library. 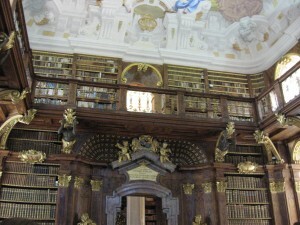 Floor to ceiling books, all of which are still used for research. It was awesome. After all of us bookworms had been sufficiently awed, we all slept the whole way back to Salzburg on the bus. Arrived at IK to discover that the heat in our dorm room wasn’t functioning, so Rachelle and I froze a bit trying to study for the test we had in class this afternoon. It’s still an ice box in here but hopefully we get a little warmer soon. This week it’s a lot more homework and then Budapest for a long holiday weekend!